Kenzie MacNeil grew up in Enfield, NS, spending his minor football and high school years within the Fall River and Lockview Dragons programs. As a NSSAF League MVP and Team MVP with Lockview High, Kenzie spent three years with the Acadia Axemen as a defensive back. He graduated with Kinesiology in 2015 from Acadia University, winning illustrious awards like Student of the Year, the Golden ‘A’, Senior of the Year, and the Kinesiology Society Community Initiative Award. 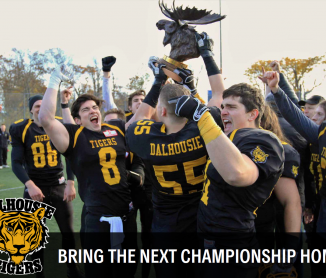 He came to Dalhousie to supplement his academic career in 2015 and spent 3 seasons with the Tigers as free safety and punt returner. He was a 2-time league all-star and team captain with the Tigers, winning a championship in 2016.